Everthing was so good and we have a great time expect the internet. The size of the rooms The stuff are nice and helpful with good smiles. Large suit, good location, exact on the metro station. Liked everything about the property, i recommend asking “Manish” to help you with your luggage! He managed to fit 10 bags in a our not so big car! He is skilled and very helpful! Lock in a great price for AlSalam Hotel Suites and Apartments (Formerly Chelsea Tower) – rated 8.1 by recent guests! One of our top picks in Dubai.Located on Sheikh Zayed Road, the AlSalam Hotel Suites and Apartments features a rooftop pool with scenic view and a 24-hour room service. Al Salam's self-catering suites are appointed with a separate seating area and a 37-inch flat-screen TV. Each comes with a fully equipped kitchen and a dining area. A washing machine and a safety deposit box are also included. Relaxing massage treatments are offered at the spa, as well as, a fitness center and a sauna. Luggage storage service can be requested. The property offers a free private parking on site. Featuring a terrace, Al Salam Hotel Suites and Apartments Restaurant & Café serves a variety of international dishes. The Dubai Mall is a 10-minute drive from Al Salam Hotel Suites and Apartments . Dubai World Trade Center is 2.5 mi away. Free parking is available onsite. When would you like to stay at AlSalam Hotel Suites and Apartments (Formerly Chelsea Tower)? This spacious apartment features a separate open plan lounge with a sofa bed, lounge chairs, and flat-screen cable TV. The separate kitchen includes a refrigerator and a washing machine and has black granite worktops. The bedroom has an extra large bed, and the modern private bathroom has a bathtub and free toiletries. This spacious suite features views of Dubai or the Gulf of Oman. It has a separate open-plan lounge with a sofa bed, lounge chairs, and a flat-screen cable TV. The separate kitchen has a dishwasher and a refrigerator and has black granite counter tops. One bedroom has a king bed and the other has 2 single beds. Some suites also have a balcony. This spacious suite features views of Dubai or the Gulf of Oman. It has a separate open plan lounge with a sofa bed, lounge chairs, and flat-screen cable TV. The separate kitchen has a dishwasher and a refrigerator and has black granite counter tops. The master bedroom has an extra large double bed and a bathtub. The other two bedrooms have either a double bed and 2 single beds or 2 single beds in each. These share a separate bathroom with a bathtub and overhead shower. All suites have balconies. AlSalam Hotel Suites and Apartments is located 20 minutes from Dubai International Airport. For leisure travelers celebrating their holidays in Dubai, AlSalam Hotel Suites and Apartments is in the centre of the city which is very accessible to Dubai’s major shopping destinations and tourist spots. With Dubai Mall and Burj Khalifa one metro stop away and having the Financial Centre metro station at our door step, lets our guests move around conveniently without having to look around for taxis. 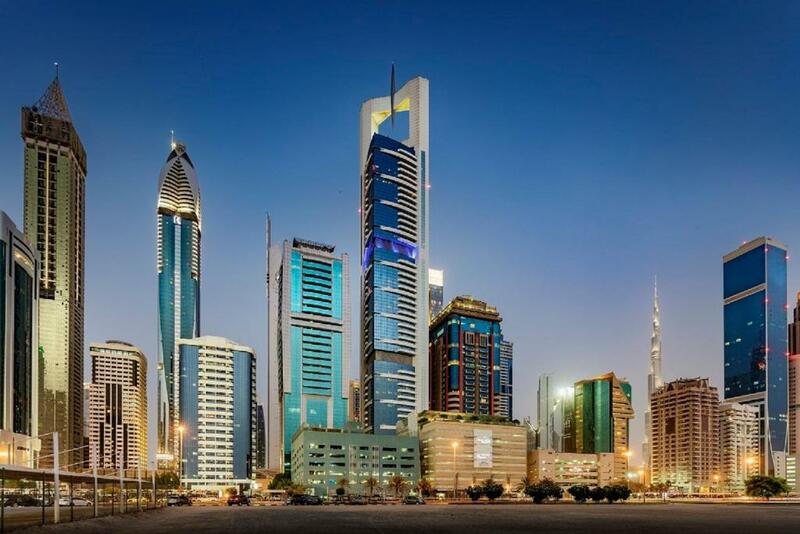 Our Sheikh Zayed Road hotel sets an eye catching addition to the Dubai Skyline. The AlSalam Hotel Suites offer guest excellent views of Dubai towards the Arabian Gulf on one side and Dubai city and Burj Khalifa on the other side. Being in the busy Financial Centre district AlSalam Hotel Suites is ideally located close to all attractions whiting walking distance. The World Trade Centre, Dubai Mall and Burj Khalifa are about 1km away and a cool walk down either side of the Tower you will find loads of Restaurants and Cafe's just around the corner. For the Beach lovers, the beautiful Jumeirah Beach is about 5 km away and the more popular Kite Beach is about 15km away. For those who would like to bargain and shop around the busy Bastakia and Meena bazar is also just a 10km away. This area is called the Old Dubai and one can be mesmerized by its heritage and cultural buildings that are still in its original state. The Dubai Museum is a monument of this and here you could see the marvel transformation of this beautiful country. Area Info – This neighborhood is a great choice for travelers interested in luxury brand shopping, entertainment and food – Check location Great location - show map Guests loved walking around the neighborhood! House Rules AlSalam Hotel Suites and Apartments (Formerly Chelsea Tower) takes special requests – add in the next step! AlSalam Hotel Suites and Apartments (Formerly Chelsea Tower) accepts these cards and reserves the right to temporarily hold an amount prior to arrival. Please note that the free WiFi is limited to 2 devices per apartment. Please note that the Credit Card used to make the payment will be asked at the time of the check-in. If you are not the card holder then you will be asked to make payment and the money will be refunded back to the Card that was previously used. Please note that the property will undergo a complete remodeling and modernization . The renovation plan will affect various areas and facilities in the hotel including the health club and swimming pool. Guests may experience some noise or light disturbances on some floors. Very noisy. The sound from other rooms was high. The property is in a really good place in center and near metro, it has clean spacious rooms, swimming pool! Will come back definitely! Facilities and area is very good. Internet is so bad and not stable coverage and performance. No disposable slippers for the washrooms and the cutlery is not cleaned properly. They should add all the costing of thier apartments when they advertise on booking. com, only to be surprised at Check in time, that we had pay 25% extra costs of this or that. This is bad, Customer needs to know DURING BOOKING TIME ITSELF EXACTLY HOW MUCH THEY WILL BE PAYING WHEN THEY CHECK IN. Not to be told much later with a hefty 25% extra costs. Very unfortunate. Because had i known earlier I wouldn't have booked this hotel in the first place. Breakfast ROOM was very small if you compare with number of guests, it looked as if they were not aware of how many customers will flock in to that tiny restaurant . So me and my family had to be taken upstairs, very lousy not clean 15 stairs we had to climb every now and then to go down to the Buffet area. IT WAS BAD. No servie upstairs. The breakfast! The place where breakfast was served is so small that it made having breakfast with a family quite awkward. The staff were brilliant nonetheless!